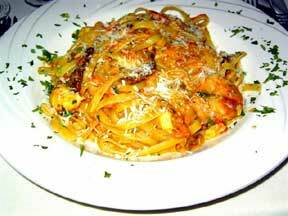 What had been Fratellis, which became the has been Galileos, is now a spruced-up Spruce Street pasta palace. Enter from 17th Street to a homey hostess station, to be greeted as warmly as can be imagined. Except for kisses planted on both cheeks, everyone at this restaurant treats you as if you are a long-lost-loved relative. Waiters abound in dark blue shirts (which, it seems get lighter in hue as importance and responsibilities rise), darker ties and darkest pants, and black shoes. Their exuberance in serving you initial crusted loaves of great chewy bread, gratis, with a bowlette of premium olive oil surrounding balsamic vinegar, gratis, engorges your ego. Here, while you wait, have some calamari, they offer, with Italian accents reminiscent of Carlo Ponti pouting over Sophia Loren. Gratis. 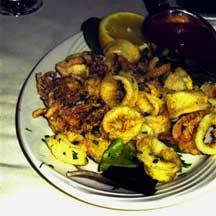 Not only is all the attention appreciated, but the Calamari Fritti is exquisite. The rounded squid pieces are presented with occasional tentacles, having been breaded lightly for frying. The golden results (matching the color of this restaurants Tuscan wallpapering) are feathery, with pearl-white silky textures. Between ones teeth, the cephalopod parts jostle with juices, to dissolve in their slightly seasoned coatings. Brilliantly done. The Caprese appetizer ($7.95) is ordered after the BYO wine bottles have been opened, and set down tableside in a bucket of ice. 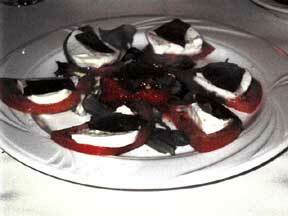 A round white plate arrives, upon which circle thick halved tomato slices. The red, lush, mouth-sized slices are topped by fresh mozzarella, just-picked-from-the-stem basil leaves, and roasted red pepper chunks. The cheese is as sweet as cheesecake, the peppers are oiled, and the basil is earthy and brusquely verdant. Fork the mélange a trois, and the tomato, between your lips for a sweet slip of the tongue. But if you want an even more superlative oral appetizer adventure, ask for a half-portion of the Gnocchi Al Gorgonzola, a house specialty ($7.50). Devouring this demi-task is so filling and rich, I warn, you may not be able to follow through to entrées or dessert. Homemade (on-site) potato pastas are rounded into quarter-inch balls, boiled just momentarily, and then immersed into a sauce infused by pungent gorgonzola and creamy mascarpone. The thick blue-flecked broth is mattress-like to the single layer of the bobbing and bobbling gnocchi. Use a soupspoon. Glide the utensil under two or three of the potato-heads, cradled in the speckled, parsleyed broth. Close your eyes, and blindly but faithfully bring the sopping morsels to your opened mouth. Slurp with stillness of expression and purpose, allowing your taste buds to savor the sanctity of the nearly religious experience. Angels appear to be singing in your ears as your eyelids reopen, seeing that dozens more of the gnocchi remain. Thank heaven. 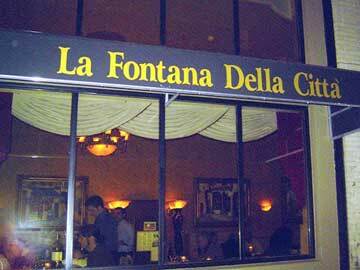 Entrées, especially those with Fontana in their name cannot be overlooked. Vitello Alla Fontana, ($20.95) for instance, is a platter on which is piled a number of pounded thin veal slices, hugged by pink prosciutto and smothered by melted mozzarella cheese. An opaque porcini mushroom sauce acts as an underlayment, spackled with darkened mushroom slivers. Jaws drop, and groans are generated every time a veal lover swallows. The portion is large and foreboding, but seems to disappear in geometric slicing progressions. A dollop of steamed green spinach complements the meal. Raffael Kupa, Bujar Daku and Gani Daku, Albanian born and bred owners, have run La Fontana Del Mare in Strathmere, New Jersey for years. Bujar acts as head chef at Citta, and appears at table-side in full whites and capo. His demeanor is as precise and brisk as his platters. Hes a cook who is devoted to reasonably priced stick-to-your-ribs-comfort-food. The Fontana, Francese, Scampi, Funghi, and Primavera sauces bring not only the palate to puckering, but bring to mind memories of classic Italian cuisine using top shelf ingredients. 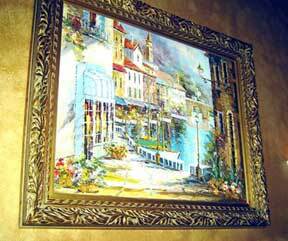 Walls have paintings, adorned with ornate wooden gold-leaf frames, depicting Italian village street and seaside scenes, emphasizing the sunny side of all the streets. Huge chandeliers hang intermittently throughout the restaurants two adjacent banquet rooms, throwing opalescent shaded light. Vases of roses appear here and there. The thick purple wall to wall carpeting would appear to soak in sound, but so much for appearances. Weekends seem to bring loud bands of baby-boomers babies (now 20 to 39), who are out to celebrate as if La Fontana Della Citta were an all-inclusive Riviera resort (including free wine). I prefer to have repasts here on nights with concert-goers of the Academy or the Kimmel, or with bevies of attorneys, no matter their ages. Dont miss the Tira Misu.